Sergeant Kristina Irizzary conducted a traffic stop on a tan Toyota Prius at approximately 11:51 PM on Wednesday, March 22, 2017. The traffic stop was a result of the driver running the stop sign at Oakley Avenue and US 19. Upon contact with driver, 34 year-old Cameron Ajax Jones of Hudson, hyperdermic needles were observed in plain view. According to the deputy, he was extremely nervous and was asked to step out of the vehicle. He consented to a pat down and in his left pocket of his shorts, the deputy felt a plastic baggie. He claimed that he did not know what it was. Mr. Jones, he pulled away and grabbed the bag and took off running on foot. Jones then threw the bag into the woods and after several verbal commands to stop were ignored, he was tasered in the back by Cpl. Brett Morris and detained. Inside of the plastic bag were .8 grams of field tested postive meth, .9 grams of powdered heroin, and 9 individually wrapped foil packets of heroin packaged for sale (< .1 gram each). Inside of the car was a loaded syringe which field tested positive for heroin, the weight of the liquid was .5 grams. An additional 15 syringes were located inside the vehicle. Jones invoked his rights and did not wish to talk. Based on the investigation, he was arrested for possession of herion, possession of meth, possession of paraphernalia, resisting officer without violence, and tampering with physical evidence. 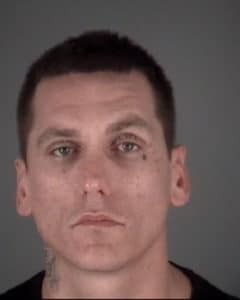 He was booked into the Land O’ Lakes Detention Center on $20,300. In 2003, Jones was arrested during “Operation Bahama Breeze” where a number of defendants brought 55 pounds of cocaine a month from South Florida to Pasco/ Pinellas for distribution. A crew from the COPS TV show can be seen filming part of the arrest in the video.